The nasoorbitoethmoid (NOE) complex is the confluence of the frontal sinus, ethmoid sinuses, anterior cranial fossa, orbits, frontal bone, and nasal bones. The intricate anatomy of this area makes NOE injuries one of the most challenging areas of facial reconstruction. Inadequately repaired NOE fractures often result in secondary deformities that are extremely difficult (or impossible) to correct. Long-term sequelae of NOE fractures include blindness, telecanthus, enophthalmos, midface retrusion, cerebral spinal fluid (CSF) fistula, anosmia, epiphora, sinusitis, and nasal deformity. Accurate diagnosis and prompt surgical treatment of NOE fractures are critical to avoid complications and to obtain an aesthetic surgical result. The image below depicts the nasoorbitoethmoid complex. A diagram of the nasoorbitoethmoid complex is shown. Note that the cribriform plate descends approximately 1 cm below the level of the ethmoid roof (fovea ethmoidalis). If the primary buttresses of the nasoorbitoethmoid (NOE) complex are violated, comminution of the entire complex may occur. This may result in telecanthus, enophthalmos, diplopia, and apparent midface retrusion. Isolated medial canthal tendon disruption releases the normal tension on the medial canthus, resulting in telecanthus. Disruption of the anterior cranial fossa may result in a CSF fistula, while disruption of the ethmoid complex and nasofrontal recess (NFR) may result in sinusitis. Patients with nasoorbitoethmoid (NOE) fractures often have associated facial injuries or panfacial fractures. After stabilization, perform a thorough head and neck examination to reveal injuries to the brain, spine, orbits, and facial skeleton. A team approach involving the otolaryngologist/plastic surgeon, neurosurgeon, and ophthalmologist is recommended. Examine the nasal cavity for the presence of CSF. Query all conscious patients about the presence of watery rhinorrhea or salty postnasal drainage. Test bloody fluid that is suspicious for CSF rhinorrhea (see Lab Studies). Examine facial lacerations under sterile conditions to assess depth of penetration or intracranial violation. Measure and document telecanthus and enophthalmos. Assess and document pupil responses and extraocular muscle mobility. Palpate the nasal bones for crepitus and comminution. Evaluate the septum for septal hematoma. Evaluate the degree of nasal or midface retrusion. Preinjury photographs may be helpful. The nasoorbitoethmoid (NOE) complex, as seen in the image below, represents the confluence of the nasal, lacrimal, ethmoid, maxillary, and frontal bones. The paired nasal bones attach to the frontal bone superiorly and to the frontal process of the maxilla laterally. The ethmoid bone is located posterior to the nasal bones. The ethmoid air cells are present at birth and enlarge to adult size by age 12 years. The overall growth and size of the ethmoid complex is highly variable among individuals. 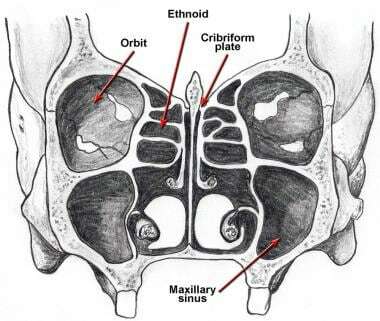 The ethmoid labyrinth separates the orbits from the nasal cavity, while the fovea ethmoidalis forms the roof of the ethmoid sinuses laterally. The cribriform plate is located approximately 1 cm inferior to the fovea ethmoidalis, and it forms the roof of the nasal cavity medially. 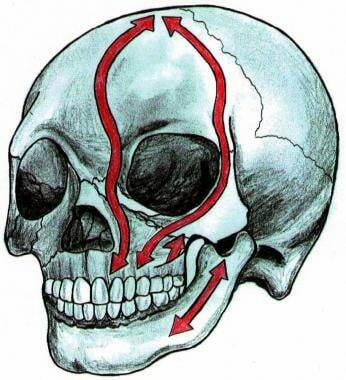 The primary vertical buttresses of the NOE complex run from the frontal bone through the medial orbital region and into the frontal process of the maxillary bone. The primary horizontal buttresses of the NOE complex are the superior and inferior orbital rims.Vertical and horizontal buttresses of the nasoorbitoethmoid complex are depicted in the images below. 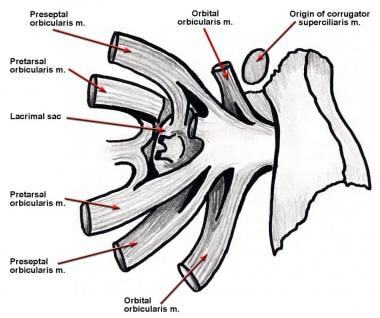 Vertical buttresses of the nasoorbitoethmoid complex are depicted. Horizontal buttresses of the nasoorbitoethmoid complex are depicted. The medial canthal tendon arises from the anterior and posterior lacrimal crests and the frontal process of the maxilla. The medial canthal tendon surrounds the lacrimal sac and diverges to become the orbicularis oculi muscle, tarsal plate, and suspensory ligaments of the eyelids. Anatomy of the medial canthal tendon is seen in the image below. Anatomy of the medial canthal tendon is shown. The tendon splits around the lacrimal sac and attaches to the anterior and posterior lacrimal crests, as well as to the frontal process of the maxilla. The canthal tendon diverges to become the pretarsal, preseptal, and orbital orbicularis oculi muscle. Normal intercanthal distance is approximately 30-35 mm. Anatomically, this distance equates to one half of the interpupillary distance, or equal to the width of the alar base. Intercanthal distance is depicted in the image below. Midface dimensions are depicted. 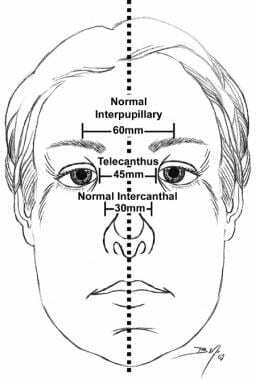 A normal intercanthal distance is 30-35 mm, which is approximately half of the interpupillary distance and is equivalent to the width of the nasal base. The key component of NOE complex reconstruction is the bony central fragment onto which the medial canthal tendon inserts. Markowitz et al (1991) devised a classification system based on the degree of central fragment injury. Each fracture type is subclassified as either unilateral or bilateral. Type I fractures represent a single noncomminuted central fragment without medial canthal tendon disruption. Type II fractures involve comminution of the central fragment, but the medial canthal tendon remains firmly attached to a definable segment of bone. Type III fractures are uncommon and result in severe central fragment comminution with disruption of the medial canthal tendon insertion. Classification of nasoorbitoethmoid complex fractures is seen in the image below. 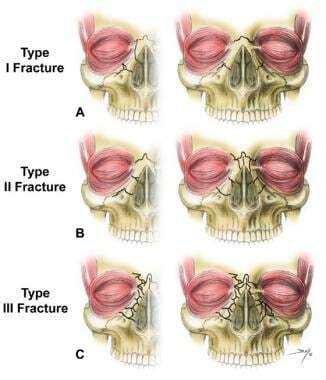 Nasoorbitoethmoid complex fractures are classified according to 3 types. (A) Type I fractures involve a single, noncomminuted, central fragment without medial canthal tendon disruption (left-unilateral, right-bilateral). (B) Type II fractures involve comminution of the central fragment without medial canthal tendon disruption (left-unilateral, right-bilateral). (C) Type III fractures result in severe central fragment comminution with medial canthal tendon disruption (left-unilateral, right-bilateral). Huempfner-Hierl H, Schaller A, Hierl T. Maxillofacial fractures and craniocerebral injuries - stress propagation from face to neurocranium in a finite element analysis. Scand J Trauma Resusc Emerg Med. 2015 Apr 21. 23:35. [Medline]. Sargent LA. Nasoethmoid orbital fractures: diagnosis and treatment. Plast Reconstr Surg. 2007 Dec. 120(7 Suppl 2):16S-31S. [Medline]. Markowitz BL, Manson PN, Sargent L, et al. Management of the medial canthal tendon in nasoethmoid orbital fractures: the importance of the central fragment in classification and treatment. Plast Reconstr Surg. 1991 May. 87(5):843-53. [Medline]. Liau JY, Woodlief J, van Aalst JA. Pediatric nasoorbitoethmoid fractures. J Craniofac Surg. 2011 Sep. 22(5):1834-8. [Medline]. Cultrara A, Turk JB, Har-El G. Midfacial degloving approach for repair of naso-orbital-ethmoid and midfacial fractures. Arch Facial Plast Surg. 2004 Mar-Apr. 6(2):133-5. [Medline]. Imaizumi A, Ishida K, Nishizeki O. An extended transcaruncular approach for naso-orbito-ethmoid and Le Fort II fracture repair. J Craniomaxillofac Surg. 2016 Dec. 44 (12):1922-8. [Medline]. Potter JK, Muzaffar AR, Ellis E, Rohrich RJ, Hackney FL. Aesthetic management of the nasal component of naso-orbital ethmoid fractures. Plast Reconstr Surg. 2006 Jan. 117(1):10e-18e. [Medline]. Elbarbary AS, Ali A. Medial canthopexy of old unrepaired naso-orbito-ethmoidal (noe) traumatic telecanthus. J Craniomaxillofac Surg. 2014 Mar. 42 (2):106-12. [Medline]. Axial CT scan demonstrates a comminuted nasoorbitoethmoid complex fracture. 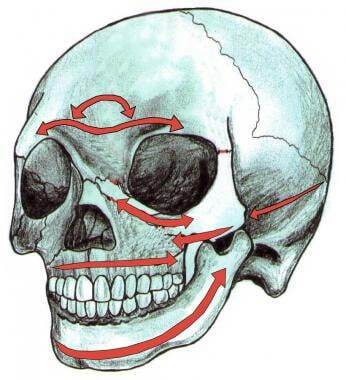 Illustration depicts the fascial planes of the forehead and temple. The temporal branch of the facial nerve runs within the superficial temporal fascia (temporoparietal fascia). Illustration depicts the subciliary approach to the orbital floor and nasoorbitoethmoid complex. (Above) Transnasal wires placed anterior to the lacrimal fossa result in rotation of the central fragment laterally, which results in postoperative telecanthus. (Below) Transnasal wires placed posterior and superior to the lacrimal fossa provide adequate support for the medial canthal tendon, and postoperative telecanthus is avoided. Reconstruction of nasal dorsum with cantilevered calvarial bone graft is shown. Disclosure: Serve(d) as a director, officer, partner, employee, advisor, consultant or trustee for: American Board of Otolaryngology; American Academy of Facial Plastic and Reconstructive Surgery<br/>Serve(d) as a speaker or a member of a speakers bureau for: Received honoraria from AO North America for speaking and teaching.